First, the good news. My nails are growing normally now. Second, the bad news. My nails are growing really slow! Like my partner said, it is natural to experience nail breakage and brittleness (in my case). And so nubbins or not, the nail designs must go on! I painted a pair of penguins on my nails. One on each hand as accent nails. I was sitting on my personal nail station without any idea on what nail design I could wear. After staring and staring on my stash, I saw that photo of my partner and I, sitting on the top shelf. Penguins came into mind as I remembered a line from the movie "Never Been Kissed", wherein Drew Barrymore's character said, "You know, Adelie, penguins, they spend their whole lives looking for that one other penguin and when they meet them, they know. And they spend the rest of their lives together." I painted a male penguin on my left hand and a female one on my right hand. I used different base colors for each hand just to highlight where the male and female penguin is. I chose Orly Gumdrop for the male hand. This took 2 coats. Stamped with an image from Bundle Monster BM19 plate. opacity in 2 coats. Stamped with an image from Bundle Monster BM16 plate. For the penguins, I used 2 coats of Sally Hansen Black Out. This is probably one of the blacks that I really like. It has a shiny finish even without a top coat. The rest of the penguin parts were painted in acrylic. Penguins are birds that cannot fly. They actually have feathers that are tightly packed together. They are great swimmers and divers. They use their wings to swim. Penguins mate for life! Okay, so they swim, eat, and mate! Great! The male penguin takes care of the chick while the female penguin hunts for food. Quite the opposite for humans, or not? Penguins use sign and body language to communicate. They use their flippers. I wonder if it is more like a morse code. How many flaps should a penguin make to say, "I am fat." Female penguins compete for a male penguin. I'm sure the guys will love this one. Penguins waddle when they walk. They don't have a choice. They have extremely short legs without knees. But surprisingly, penguins can walk faster than humans! Now, that is something! It is a bit challenging for me to work with very short nails. Worse, my natural nails are not of the same length. My pointer and pinky nails are really, really short. If only they could be like the one on my ring finger. But challenges are always welcomed on my table. 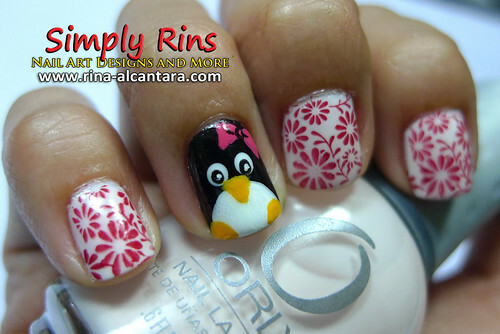 Anyway, I hope you liked this penguin nail art on my short nails. Oh they are adorable :) They look so cute! And nice with a nail art on short nails, since I prefer short nails! And I love that fact you found about penguins..! Makes it much more interesting :) Yay! It's in spanish but you can translate it into english using google translator on the side bar. Adorable! I HAVE to test this out! omg, this is so cute... and it doesn't seems too hard, i must try this, may i please!? heehee I like how you have a boy and girl version! OOooh So Cute! I want to try it today! I'm still waiting for my new Bundle Monster so this should satisfy me! Great work. As always you rock my socks. Oh, wow! I am overwhelmed with all your comments! Thank you so much for all the kind words for my penguins. I now feel that they deserve names. I will definitely try that design! :) so cute. The girl penguin is so cute! How did you make such perfect circles? Did you use a stamp or is it hand painted? And I have short nails and I hate it when I see nail designs that I really like but they are done on really long nails, but these are not on really long nails and they are so adorable!